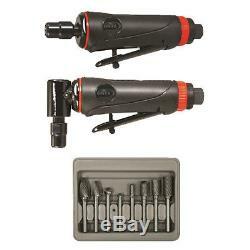 Astro Pneumatic ONYX 3pc Die Grinder Kit - 219. 201 - Composite Body 1/4 Die Grinder - 25,000rpm - Rear Exhaust. Rib textured handle provides a firm grip. Lever throttle for feathering control. Air Inlet Thread NPT: 1/4. 204 - Composite Body 1/4 90° Angle Die Grinder - 20,000RPM - Rear Exhaust. Double Cut Carbide Rotary Burr Set, 1/4 Shank in Blow Molded Case. SA-5: Cylindrical shape 1/2" X 1". SA-3: Cylindrical shape 3/8" X 3/4". SC-3: Cylindrical radius end 3/8" X 3/4". SC-1: Cylindrical radius end 1/4" X 5/8". SF-3: Tree shaped radius end 3/8" X 3/4". SF-5: Tree shaped radius end 1/2" X 1". ABTM part number: AST 219. Auto Body Toolmart has been serving the Automotive Industry for over 30 years. The item "Astro Pneumatic ONYX 3pc Die Grinder Kit 219" is in sale since Wednesday, March 11, 2015. This item is in the category "eBay Motors\Automotive Tools & Supplies\Air Tools\Air Grinders". The seller is "autobodytoolmart" and is located in Elgin, Illinois. This item can be shipped to United States. California Prop 65 Warning: This product can expose you to chemicals including Gasoline engine exhaust (condensates/extracts) which is known to the State of California to cause Cancer and Ethylene glycol (ingested) which is known to the State of California to cause birth defects or other reproductive harm. For more information go to www.P65Warnings.ca.gov.